Depeche View loads all C++ source code files (.cpp/.hpp etc.) from a directory tree, showing the code lines from all files within a single window. This allows high speed research across thousands of source files. 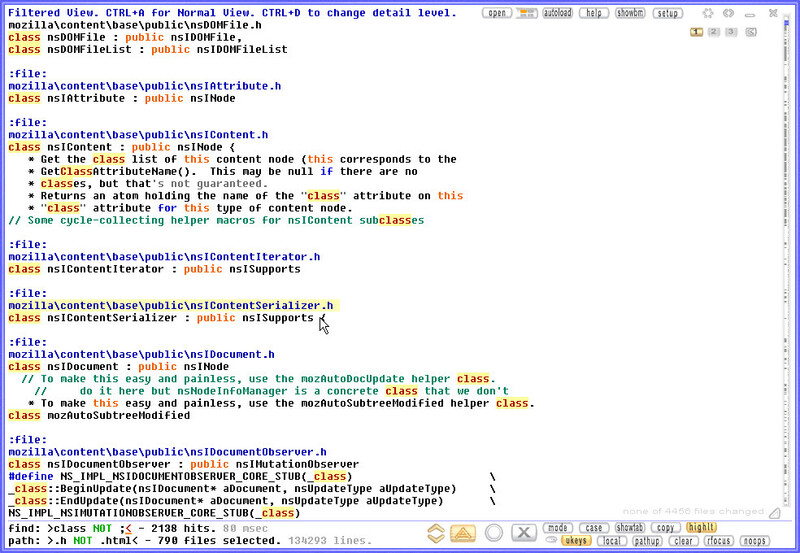 Example: searching the word "class" across 790 C++ header files. Search words as you type, or by clicking on them. Fly through search results by the turn of your mousewheel. Copy text, and create bookmarks with the same ease. If you have to read through many small ASCII text files, e.g. source code, this tool allows text analysis at extreme speeds. For example, to search a word, forget about opening a dialogue, setting options, clicking through results lists to open one result file after another. No, just type the word - and land within the first matching line in the first matching file, instantly. Then, if you see another word of interest, don't even type it - click on it! And again, you will land at the first match for this word, instantly, no matter in what file. By default, you jump from result to result in the normal text. Even more efficient is the filtered view: click on the large "F" button at the right bottom to show only the text lines containing the search result. allowing instand reading through that area. To re-enter the filtered overview, just press CONTROL+A or (with active auto filter mode) type another search term. Depeche View is a Windows tools, but also runs on i386 Linux systems having WINE installed (type wine dview -linux there). Depeche View Base is free for private use. Depeche View Extended Edition can also view .zip .jar .tar.gz and tar.bz2 contents directly. Fully portable executable, runs without installation. The free download is available here.